Francine Prose, Reading Like a Writer: A Guide for People Who Love Books and for Those Who Want to Write Them (Harper Perennial, 2006) A lovely book. Bryan Garner, Garner’s Modern American Usage, 3d Edition (Oxford, 2009) Garner takes on usage fearlessly, analyzing what changes are acceptable and what aren’t. He tackles common words and errors as well as more technical distinctions. Essays are interspersed with word entries, all highly readable. Word wonk heaven. Donald Maass, The Fire in Fiction: Passion, Purpose and Techniques to Make Your Novel Great (Writers Digest, 2009) The title says it all. Elizabeth Lyon Manuscript Makeover: Revision Techniques No Fiction Writer Can Afford to Ignore (Perigee, 2008) Lyon shows fiction writers how to think differently about their work. Terrific discussion of “inside-out” and “outside-in” revision, revising for genre, use of structure, and characterization. Ted Kooser, The Poetry Home Repair Manual: Practical Advice for Beginning Poets (Univ. Of Nebraska Press, 2005) I read this on a 60 mile backpacking trip through the Bob Marshall Wilderness, but it’s great for the couch, too. 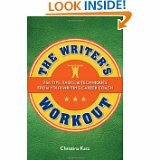 Christina Katz, The Writer’s Workout: 366 Tips, Tasks & Techniques From Your Writing Career Coach (Writers Digest, 2011) What I’m asking for! And don’t forget, Books, Crooks and Counselors! This entry was posted in References for Writers and tagged books, Bryan Garner, Christina Katz, Donald Maass, Elizabeth Lyon, Francine Prose, Mark Doty, Ted Kooser by Leslie Budewitz. Bookmark the permalink.